TIANJIN, China, October 24, 2011 (ENS) – China and Taiwan have agreed to cooperate on nuclear safety in the aftermath of Japan’s nuclear crisis. Under the agreement, officials from both sides will alert one another if a major accident occurs and cooperate in limiting damage. Cooperation and exchanges in this area can reduce the occurrence of nuclear accidents or prevent such accidents from occurring in the first place, the agreement states. Mainland China’s Association for Relations Across the Taiwan Straits and the Taiwan-based Straits Exchange Foundation signed the agreement Thursday during talks in Tianjin, a city in northern China. “Nuclear safety touches everyone’s lives on both sides of the Taiwan Straits and is related to the environment we all share,” said Chen Yunlin, president of ARATS, who signed the agreement with Taiwan Strait Exchange Foundation Chairman Chiang Pin-kung. “Safety First is the application of universal adherence to the basic nuclear principles, relevant to human health, safety, property and the environment,” the agreement states. In the past, the two sides of the Taiwan Strait have handled cooperation, exchanges, and discussions on nuclear power operations through private channels. Under the new agreement, the two sides guarantee transparency in the construction of nuclear plants and the monitoring of existing power stations. Currently, the China has 14 nuclear power reactors in four separate sites. It also has the world’s highest number, 26, nuclear power generators under construction. Many of these are concentrated in the southeast coastal area, which, like Taiwan, faces potential threat of earthquakes or tsunamis. “In the current absence of an accident reporting and cooperation mechanism between the two sides, the security of these nuclear facilities is steadily becoming a focal point of concern among the people of Taiwan,” according to Taiwan’s Atomic Energy Council, a division of the Mainland Affairs Council. China’s National Development and Reform Commission has indicated its intention to raise the percentage of China’s electricity produced by nuclear power from the current one percent to six percent by 2020. Taiwan currently has six nuclear reactors at three power plants and, which supply 8.1 percent of its national energy consumption. Another large nuclear power plant on the northeast tip of the island is under construction. Japan’s nuclear disaster started on March 11, when a magnitude 9.0 earthquake and a massive tsunami knocked out cooling systems at the Fukushima Daiichi nuclear power plant on Japan’s Pacific coast, sparking meltdowns, a series of explosions and releasing huge amounts of radiation into the environment. Tens of thousands of people remain displaced from their homes and businesses in a 20 kilometer (12 mile) evacuation zone around the Fukushima Daiichi plant. Fully restoring the contaminated areas is expected to take decades. David Yao, director of the Planning Department at Taiwan’s Atomic Energy Council, told reporters that the agreement is necessary because radiation leaks could be a cross-straits concern. Mainland China, which is closer to Taiwan than Japan, has 14 nuclear power generators in operation. 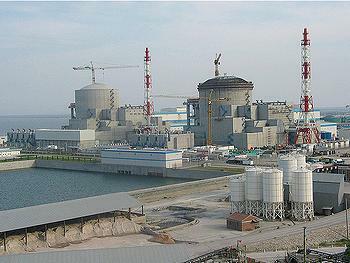 “The lesson from the Fukushima Daiichi nuclear power plant incident is that the effects of a serious accident can spread widely, and therefore neighboring countries should establish mechanisms to coordinate regional safeguards as well as strengthen information reporting and exchanges to promptly understand the situation of the accident and take necessary response actions,” said the Atomic Energy Council. “Under the principles of ‘nuclear safety knows no borders’ and ‘safety first,’ countries around the world are actively enhancing international cooperation to improve nuclear safety,” said the AEC. Xia Yihua, a radiation expert at the China Institute of Atomic Energy, applauded the agreement, saying cooperation to exchange information on nuclear safety should not be hindered by political obstacles across the Straits. Nuclear safety teams from mainland China and Taiwan will meet within two months after the agreement takes effect. Work groups from each side will discuss how the information sharing and exchange programs will be accomplished. SEF Chairman Chiang said that the institutional talks between SEF and ARATS over the past three years have brought many tangible benefits for cross-Straits exchanges that should be maintained. The cross-strait nuclear safety agreement was signed at the seventh high-level meeting between officials from mainland China and Taiwan since Taiwan’s President Ma Ying-jeou took office on May 20, 2008. 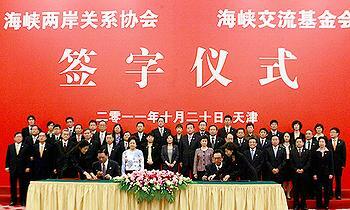 The pact was the 16th bilateral accord signed under President Ma’s administration. A series of surveys gauging public opinion have consistently shown strong public backing in Taiwan for institutionalized talks between Taiwan and China, the Mainland Affairs Council said Monday in a statement.